It is a pretty basic function that most other composition programs offer, and have been used for hundreds of years in different kinds of notation. It is too limiting as it is presented today on noteflight, and have been that for too long. I finally left and bought software. What's the point in having composition software that you CAN'T COMPOSE on?? If feel ripped off, to be honest. I had a subscription for years because it was always "coming soon." What a waste of money and time. My time with Noteflight was a completely frustrating experience. Yes! i need this function in a song I'm writing right now. I need to be able to write a RH piano part with four voices - the second voice resolving while the others hold. For now I am having the LH pick up the bottom note. If this is function is not soon added I will be spending big bucks on something else out of necessity. Has any progress been made on this? It's very difficult to write drum set music in the standard style with only two voices. What can be done? Thanks. @Dylan Nicholson. You are incorrect. You must not work with guitar notation which is an unfortunate truth for so many composers. I realize it is difficult but if you are composing for the guitar please learn our notation. Nobody is telling Bb and Eb instruments to just change there system of notating in transcription are they? I'm sorry it's taking so long - we are super busy with a big new project so some of our important editor projects are taking longer than usual. Don't give up on us! @Robin McClellan - Thank you for the reply. I've been a Premium member of Noteflight for almost two years, but still have not really been able to use it. Yes it will! It is actually on our "short list" but we are building some other big stuff, beyond the editor, that is slowing us down on editor stuff. But don't despair, this will be ready before long! This is still not implemented yet. Will it ever be? BTW regarding the guitar examples given below, in all cases I think see better ways of notating them that don't require more than 2 voices per stave. It's actually a little surprising guitarists don't learn how to read from multiple staves for this sort of music, but even without that, unless the composer is really very specific about when they want notes in the lower voice to be stopped, in most cases just using l.v. ties would suffice to show arppegiated lines. I actually disagree. I think the only reason scores in the past had more than 2 voices per stave were because of difficulties increasing the number of staves. Music with 3+ voices per stave is almost always impossible to read. If the software makes it easy to split one part up into to multiple staves then you don't need more than 2 voices per stave. @Robin McClellan - Thank you for your reply. It does go a long way, and I appreciate your taking the time to respond. We are sorry not to have provided a fuller reply! We marked this "Under review" which was our way of saying that we are discussing it - and indeed we have been actively discussing it in the last few months, because we know how important it is to our users like you. The decision-making process for new features is very tricky and involves balancing a lot of factors. Sometimes a very needed and desirable feature like this is very complicated for our software developers to build, or involves redesigning or altering other features that many users already depend on. So, that's a long way of saying that although we probably won't have this feature ready within the next few months, we have not forgotten about it! We sincerely hope you'll stick with us, and we truly value your feedback. Too bad leaving feedback does no good. Choral and Classical Guitar composers have been BEGGING you to add at least a third voice for the last 8 years(! ), without even so much as a one-word reply from Noteflight staff. 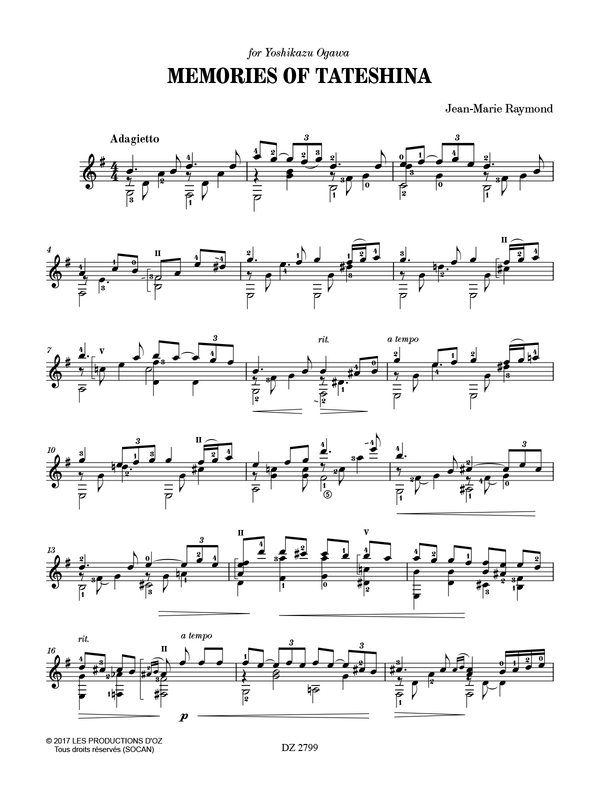 For example: look at the first two measures (or any measure, really) of "Memories of Tateshina" by Jean-Marie Raymond ( https://www.stringsbymail.com/images/DZ2799_b.jpg ). This is a *simple* piece for guitar, written in an extremely *common* style and yet, Noteflight still can't handle it. I like Noteflight. I want to stay with Noteflight. However, there is less preferable, but completely free software available that allows for more than two voices, and when my subscription for NF ends in a couple of months, I need to know whether or not I'll be able to renew it. If there aren't at least three voices by then, Noteflight is useless to me. Please, PLEASE acknowledge your users, even if it's a "No, we'll never do that" so we can stop wasting our time. Thank you for looking. This is no small matter for classical guitarists, I want to love Noteflight, but can't recommend it to others without this feature. Not everyone composes for piano, and those of us who compose for classical guitar have been asking for this feature since 2009. We really NEED to be able to write more than two voices on treble clef. I even paid for Premium, as it never occurred to me that NF wouldn't allow me to do what other free programs (such as MuseScore) can do. The new Groups feature is great, but to add extraneous features without first taking care of what is, for us, basic functionality is a bit mind-boggling, particularly since it's been asked for before. Cheers for a great piece of software, but please, please, PLEASE implement this already, so I don't have to leave. There have been times where I was composing pieces like 'Mary, Did You Know?' for my a cappella group and needed 3+ voices a single line. I.e. ; I know you can add an upper or lower voice, but I have desired before to create bell chords of 8 notes, and that is impossible without adding another piano, which is confusing to read. Anyhow, I love the current setup, it's just a small feature that could be greatly successful. Why isn't this a thing yet? As a classical guitarist, I really NEED to be able to write more than two voices on a single staff. I even paid for Premium, as it never occurred to me that NF wouldn't allow me to do what other free programs (such as MuseScore) can do. The new Groups feature is great, but to add extraneous features without first taking care of basic functionality is pretty ridiculous.